Supported by a fantastic team of guides, muleteers and cooks, Choquequirao Tour is truly a spectacular hike to visit the pages of the ancient history of the Inca Empire. Choquequirao, impressive not only by the archaeological complex, but also by the views offered by the tour from the city of Cusco. The vegetation, the view of the canyon of Apurimac, one of the deepest canyons in America, makes this trek an unforgettable experience. Built on top of a mountain in the Andes of Peru, the archaeological complex of Choquequirao, can only be compared to the majesty of Machu Picchu, in its beauty, its architectural grandeur and achievement. The ruins of this Inca city is at an altitude of 3050 m. A marvel of ancient stone walls that protect the palaces and temples. The fountain systems, canals and aqueducts that feed the terraces of cultivation are intact and that many miles away are clearly visible. Early in the morning, we leave Cusco for the town of Cachora, where we will have breakfast and we will meet with the muleteers who will carry the luggage. After a two-hour hike we will be in Capuliyoc (2910 m), from this point you have a breathtaking view of the Apurimac valley, the Nevado Padriyoc and Wayna Cachorra. Then we descend to Coca Masana (2235 m), where the climate, flora and fauna of the area begins to change significantly, finally arriving at Playa Rosalina (1540 m), Where we will spend the night. Second day: Archaeological site of Choquequirao. Early in the morning, after an energizing breakfast, the ascent begins with an approximate of 5 hours to Rayanpata, next to the Chunchullymayo River, place of rest and lunch. We will continue the stretch from Rayanpata to Choquequirao (3035 m ), approx. two hours of walking, arriving we will have time to appreciate the sunset and sometimes the flight of the Condor. On the way to Choquequirao you can see many varieties of orchids and types of birds. 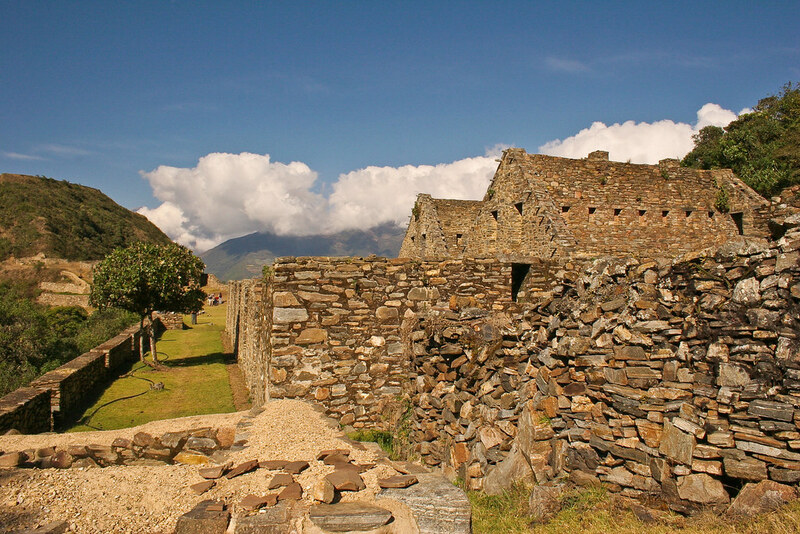 After breakfast, we will explore this incredible archaeological site of Choquequirao, where our guide will explain in detail the history and importance of this place. Then you will have free time to explore these impressive buildings at ease. Then we will start the return to Capuliyoc. Camp. This is the last day of the tour to Choquequirao, you will be able to appreciate the majestic Apurimac Canyon, considered one of the deepest of the region. Then we will take a path that crosses the gorge of the canyon, with a spectacular view also of Waynaqally, to finally reach the town of Cachora. In this place does not wait for our private bus for the return to the city of Cusco. Cook specialized in Peruvian dishes. 2-person sleeping tents, mattresses, chairs, dining and kitchen tents. 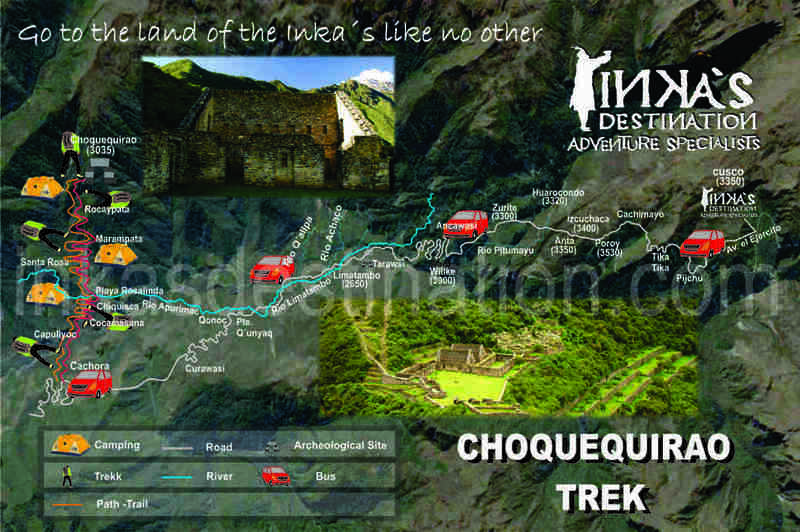 We also offer personalized Choquequirao Trek in private groups. If you are interested in taking a private tour with us, please clarify in form. Cost are per person and in USD (United States Dollar).